WhatHouse? 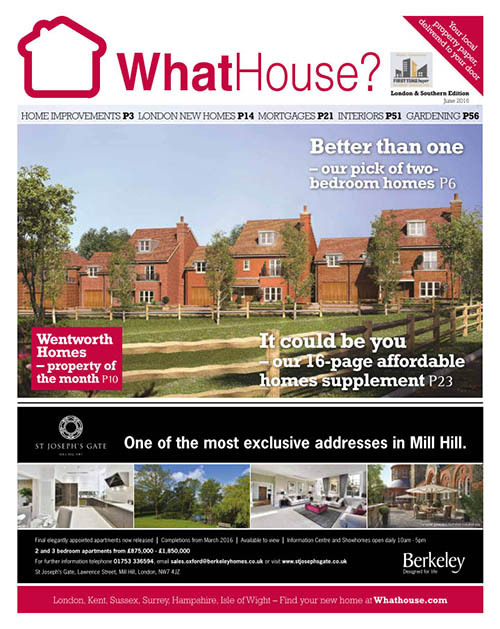 is a free-of-charge print supplement to Whathouse.com, the UK’s leading specialist new homes portal. The newspaper was launched in December 2013 and they now produce 10 issues a year (monthly February-June and September-December, with bimonthly summer and winter editions), with a typical pagination of 56-72 pages. Some 285,000 copies are printed of each edition. The newspaper covers a wide range of property types and prices, with regular coverage of subjects of particular interest to first time buyers, in special features or supplements, as well as in regular regional and topic spots. Expanding on the newbuild speciality of the portal, the newspaper also embraces re-sale homes and rental markets, as well as monthly columns for topics such as mortgages, interior design and gardening, across a broad budget spectrum. Supplements in 2016 have included affordable homes and first time buyers, as well as buy-to-let, retirement and their own diverse WhatHouse? Awards.